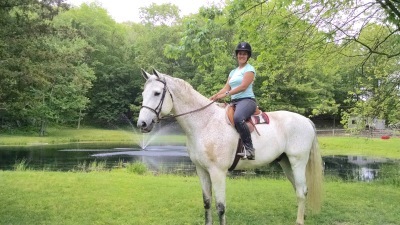 Laurel Ledge Farm is conveniently located in the Montville area of Southeastern CT. We offer horseback riding instruction for adults from advanced-beginner through upper-level jumping and dressage. Whether you haven't ridden in a while (months, years or decades), or have been riding regularly and want to polish your skills, our well-regarded lesson program will take you to the next level. 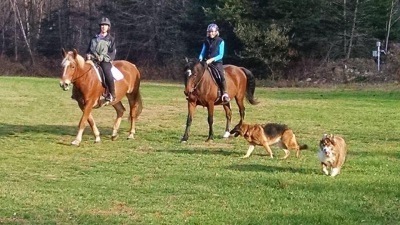 Laurel Ledge Farm LLC has been helping riders develop their basic through advanced skills since 1993 and students give our program rave reviews . One of our specialties is effectively dealing with fear issues. If fear has been holding you back from being the rider you want to be, then let us show you how we build confidence and reduce anxiety. Our lesson program's secret to success is pairing the rider with an appropriate horse and having the patience to let students progress at their own speed. The Laurel Ledge philosophy is to help committed students develop as a complete horseperson. For those who have experience with our horses and have attained independence, we offer the opportunity to come early and/or stay after your lesson to practice unmounted skills like groundwork, spend extra time grooming or other horse care, etc. Your experience at Laurel Ledge Farm includes many amenities like an indoor arena, shaded outdoor arena, heated lounge with a bathroom and much more like our new expanded cross country course opening in the summer of 2018. Click here to schedule your evaluation lesson or have any questions answered about our riding lessons or horse boarding.